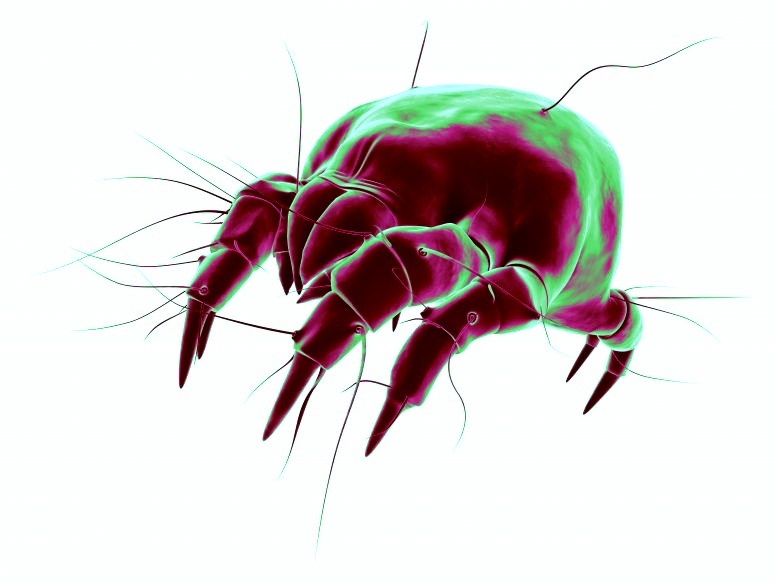 Most homes in temperate and or humid climates will have a population of house dust mite- in the European area it is most commonly the species Dermataphagoides pteronyssius. These are small (0.2 – 0.3 mm long and invisible to the naked eye) 8 legged creatures and are members of the arachnid family. They love dark humid conditions which are present in most homes, especially at this time of year as a consequence of closed windows and heating systems in operation. In general, the optimum conditions for growth of house dust mites are temperatures of 20-25 degrees C and humidity’s of 70-80% RH .They live primarily on shed skin flakes present in house dust and detritus which, believe it or not, typically contains up to 80% of human skin flakes. They are benign harmless creatures in their own right but the material contained in their excreta and from their decaying bodies is responsible for triggering allergic responses in many sensitised people (sneezing, runny eyes, inflammation of nasal passages and eyes, skin rashes, asthma and wheezing). Many of the dust mite allergens are enzymatic proteases or of similar structure and are thought to consist of lysozymes, cysteines,and trypsins . This is a perennial allergen response as opposed to pollens which are seasonal. Considering their preferred living conditions they are primarily found in micro-environments in the home which can give them optimum conditions such as beds (mattresses/pillows,) soft toys, cushions, and carpets. Beds are great sources of skin flakes and heat and humidity from bodies in close contact with the mattress. It is even mooted that the mites have “tidal” behaviour -migrating up to the top of the mattress when the bed is occupied and returning to the interior when the bed is empty! Carpets are also a key reservoir of dust mites as they are often laid against a cold (compared to the room they are in) floor and hence have a high humidity at this boundary and are dark at the base of the pile. So can you remove or neutralise the effects of these creatures and their detritus to reduce the allergenic response as opposed to only treating the symptoms? Avoidance, removal, environment change and chemical treatments are all possible. However it is often not easy to achieve a level of removal / control in a whole domestic environment that is below an allergen trigger threshold. Further details can be found in articles from the University of Glasgow and the University of Sydney. Even effective localised treatments need to be considered in light of the whole home’s allergen and mite reservoir and many individuals might be sensitised to more than one allergen class. Control methods include frequent vacuum cleaning of carpets etc. with a high efficiency machine (HEPA filter) to prevent re- distributing the allergenic material, occlusion covers on mattresses pillows, changing the environment by minimising carpet areas or lowering ambient humidity (e.g. see trials of various approaches). Acaricides (insecticide type products) to kill mites and allergen neutralisers have also been suggested which work by blocking specific sites on or changing the structures of many of the proteinaceous allergens (see e.g. this patent). Regular dusting, frequent washing of bedding, dry cleaning of duvets, high temperature steam have all been shown to have some effect and probably work by removing mites/allergens, killing mites or neutralising the allergens. There are also medical developments ongoing to further develop allergy immunotherapy treatments into more convenient dose formats which will treat the person rather than the environment (e.g.in multi allergen sensitised sufferers see this double-blind study from 2001 and this more recent paper).